Iconic musher DeeDee Jonrowe dropped out of the 2018 Iditarod Trail Sled Dog Race on Tuesday afternoon after suffering flu-like symptoms roughly 150 miles into the 1,000 mile race, according to her husband. This year was Jonrowe's 36th time starting the Iditarod, and she announced in December that it would also be her last. "I just felt that it was time to step back," she said in an interview soon after she announced her upcoming retirement from racing. At 4:41 p.m. Monday, 64-year-old Jonrowe and her team of 16 sled dogs pulled into the Rainy Pass checkpoint on Puntilla Lake, at mile 153 of the trail. Friends had flown her husband, Mike, to the checkpoint that day as a birthday present (he turned 66 years old Tuesday). Mike Jonrowe said his wife seemed upbeat and happy early Monday evening. She planned to drop two female dogs from her team because they had gone into heat, but otherwise the team looked solid, he said. But then, DeeDee got sick. "After we left she said she started sweating and got soaking wet and it might be the flu that everybody's got," Mike Jownroe said. He said doctors at the checkpoint gave her an IV with fluids. The next day, the couple talked on the phone for about 10 minutes as she weighed whether to continue racing. "She was more concerned about whether or not I would be disappointed," Mike Jonrowe said in a phone interview Tuesday. "It was a silly thing to say because I'm never disappointed in her. I'm very proud of her." He said since a majority of teams had come and gone from the checkpoint, DeeDee worried her team would have to break trail, leading to further exertion, more fluid loss and the possibility that she would have to press the help button on her race-tracking device. "She just didn't want to put the dogs or other people at risk," he said. Since 1980, DeeDee Jonrowe has missed just three Iditarod races. Despite a serious car accident, despite breast cancer, despite the deaths of her parents and despite the wildfire that turned her Willow home to cinders, Jonrowe kept showing up at the Iditarod starting line. She finished 32 of her 35 previous Iditarods. She has 16 top-10 finishes — two of them as runner-up. Before the race, Jonrowe said her final run to Nome would allow her to connect with friends she's met over the years. "I'm going to say goodbye," she said. "I'll do the very best job I can (racing), but what's important is to thank people who have made my way of life available." Jonrowe reminisced about those with whom she shared time on the trail with, giants of the race who are no longer here. She recalled camping with Jerry Austin, racing with Susan Butcher, sharing stories with Joe and Norma Delia in Skwentna, seeing the smiling face of Herbie Nayokpuk, learning about dogs and sleds from Rudy Demoski and Joe Redington Sr.
"A lot of memories," she said. "I won't say ghosts, but memories. I'm not sad. I'm not sad at all. I'm looking forward to the arches of Nome." Mike Jonrowe said he still expects 2018 to mark his wife's last Iditarod. He said she plans to help at the checkpoint in Unalakleet and then head to Nome to watch teams finish the race. 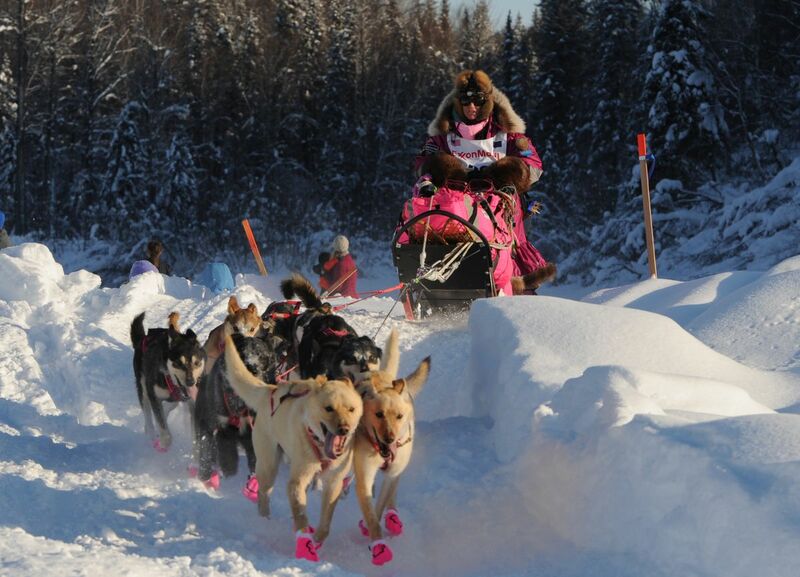 DeeDee Jonrowe, who scratched at 11:12 a.m. Tuesday, is the second musher to drop out of the race. Zoya DeNure, 41, scratched at 7:49 a.m. Monday at the Skwentna checkpoint, citing "personal health reasons." ADN reporter Beth Bragg contributed to this report.